Have you ever had inspirational moments where something new and different just pops out? You can’t explain the process – it just happens! The creative process starts in the right brain – which doesn’t know words, only patterns. Once our right brain has possession of the ideas and patterns, the left brain needs to take over and put the ideas into words to share with the world. This is a quick Right brain/Left Brain test. Which way is she spinning? 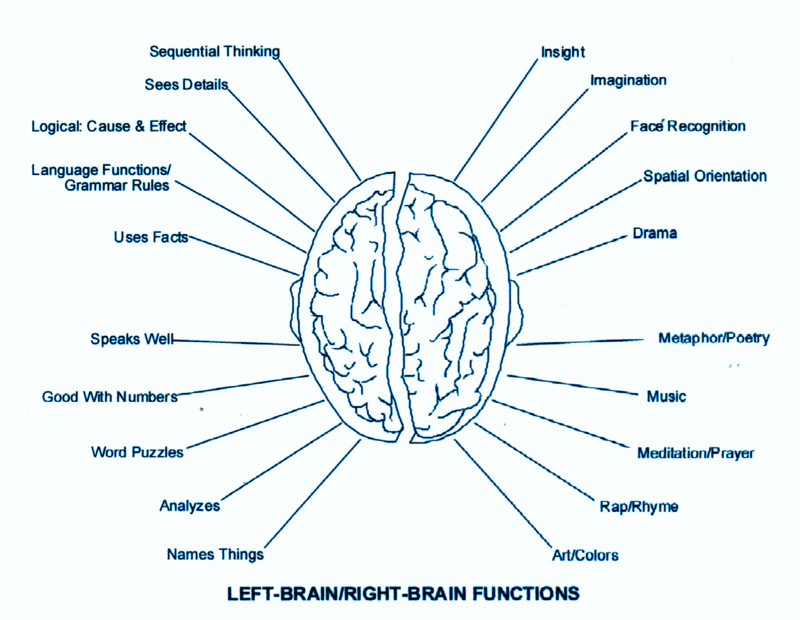 So… which MBTI types prefer which side of the brain? If you don’t know your type, take this quick quiz and remember your letters. All sixteen personality types use both sides of the brain, but in general, Js tend to use the left side of the brain more, Ps the right side. This post explains more about the differences. I wonder if it depends on the type. I think INTJ’s would be left brained while INFJ’s would be more right brained. But yeah, I agree, J’s in general would be left brained and P’s right brained. It’s like this guy’s brain is acting as two brains, but only one can talk and make itself know. Anyway, check it out. It’s really interesting. Both these links are fascinating. The second one really illustrates the different functions the two halves of our brains are responsible for. The first link then amazes to think that the left half of the brain in the little girl was able to adapt and account for all abilities! You bring up an excellent point about INTJ and INFJ both being left-brained but with differing amounts of left-brainedness (I just made up that word). I will do a post soon concerning this subject; how our dominant introvert and extrovert preferences influence our right-or-left-brainedness!